We get perspectives from both sides of the mental illness spectrum. First, we talk with Dr. James Kagan, MD, a psychaitrist with over 40 years of experience. Dr. Kagan is also co-author, with Dr. Rick Delaney, Ph.D., of A 3-D View of Foster, Kinship, and Adopted Children. 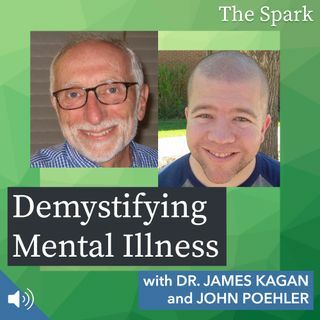 Dr. Kagan gives us a run down of mental illness from a clinical standpoint and talks about his new mental health screening process, called ADAPT. We also talk with John Poehler, who writes for The Bipolar Battle, a blog ... See More which seeks to help empower those afflicted with bipolar disorder live the life they deserve. John opens up about living with bipolar disorder, his diagnosis, breaking the stigma associated with the disease, and his life with his family.